The beta version of Gov.uk, the single government website, marks the official start of the Government Digital Service’s ambitious remit. 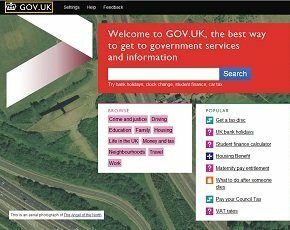 The release of the beta version of Gov.uk, the website which will eventually replace departmental sites and handle online government transactions, marks the official beginning of the public-facing existence of the new Government Digital Service (GDS). GDS has a remit to fundamentally change public services to a "digital by default" model and Gov.uk is the first phase of delivering that goal.. Simplicity is the key message behind the beta version of the site. “Sometimes government information is inevitably complicated, but we are trying to do things the Apple way by putting all our intellectual effort into making things simple,” said Tom Loosemore, deputy director of GDS. GDS is militant about semantics, insisting that it "isn’t a launch but a release" which will continually be developed, and rather than publishing "pages" will be looking at user needs. “We’ve made the core services simpler, faster, cleaner, better for the user. And that is the clear direction of travel,” said Bracken. The beta version of Gov.uk is the first step on GDS’ journey to move public services to become digital by default, as it will eventually become the platform for government online transactions – a move which is hoped will save the taxpayer millions of pounds a year in service costs. Later this quarter GDS will be releasing the beginnings of a platform that will replace the core online functions of departments. Bracken says GDS is also keen to work with smaller companies as Gov.uk grows to encompass more services and develops its transactional layer. “One of our core principals is don’t do everything yourself. There are some fantastic small companies that often have a strong cultural and social ethos where the project they are working on is more important than the bill. To exclude them is almost sinful because we’ve got so much talent in this country,” he said. However, addressing the publishing layer will take a whole year. “The release of the beta is just the start - and will never stop, as we continue iterating. We’ve already committed to having Business Link as a next-generation service by the end of the year,” said Bracken. Gov.uk is currently focusing on 700 core user needs, but will eventually include a long tail of thousands. Because 90% of people will come to the site through Google, getting the landing pages right is key to its proposition, says Loosemore. “They will type in a search and we need to make sure they land on a place where all the information is clearly laid out and written," he said. “The government is good at producing words but on the web people don’t read, they scan. So we’ve done a lot of work around the design of information - stripping away the extraneous copy is important. It’s not friendly, because people don’t want that but it is definitely clearer; stylistically it’s less like a tsunami of words.” For more complicated queries, further information is contained on the site through PDF documents. There’s also a big emphasis on "relatedness" and there are fewer links on the page than Directgov, said Loosemore. All the code is open source – “It has been from the start – why would you do it any other way?” – and uses HTML5. Geo-location software means that when people search for information about council tax, for example, they are automatically landed on the appropriate tax page to their area. The mobile web is also central to the use of government services. GDS has used responsive web design, which helps the layout change according to the user’s computer screen resolution, so it hasn’t had to build a separate mobile site. “To get a sense of how quickly things are moving, when we started we had conversations about responsive design being the future but no one had done it at any scale – and in the space of just two months it has matured enough for us to give it a go for corporate platform,” said Loosemore. The big cost savings associated with Gov.uk will come through more citizens transacting with government online. However, this will not be a straightforward task, said Bracken. “The transaction layer is a much bigger ask, as we have to go to the technology stack, look at the integrated service delivery, look at contact centres – that is the future challenge for GDS. The beta version of Gov.uk marks the start of our public reaction to that challenge,” he said. Another key aspect of transactions is the work on identity assurance (IDA), which is intended to create a marketplace of private sector providers which citizens can choose to identify themselves online. Bracken is now the senior responsible owner for IDA. “It’s something that I put my hand up for because it’s so important. Unless we have better and wider used security protocols, it will be hard to identify users, allow transactions and link up services. Even some of our best services, like driving registration, require users to put all their data in for parking permit even if they have already submitted it for registration. There is no common ID framework recognised in two places,” he said. “What we are building is not an IT programme but standards the market can coalesce around. So it’s more nuanced than classic IT programmes, where you throw in a system integrator and wait for it to be delivered,” he said. By focusing on the citizen’s needs in its creation of Gov.uk, GDS hopes citizens will increasingly use the domain to address specific problems more effectively and quickly. By doing so it not only stands to improve the user experience of government services, but also ease the public into a new way of interacting with government – particularly those who have previously shied away from online engagement. Moving to a digital-by-default model through Gov.uk in a sector not traditionally known for its innovation will clearly not be without its challenges. But as the beta test begins that long journey Loosemore is sure of one thing: errors will be made along the way. It’s a pragmatic approach that should put GDS in good stead for its service delivery roll-out. “We will make mistakes and possibly some bad ones, we can do a lot of tests but until people actually use it we will not know," said Loosemore. "And that is culturally very different from the way government does its services, where it does a launch and then has no capacity to iterate."